i got this recipe from my friend Eric in college. Where he got it from, I’m not sure– but it is so delicious, easy and versatile. Tastes great with roasted vegetables, on its own or on a salad. For lunch tomorrow, I decided to put it over spinach sauteed w. garlic and oil and cous cous. 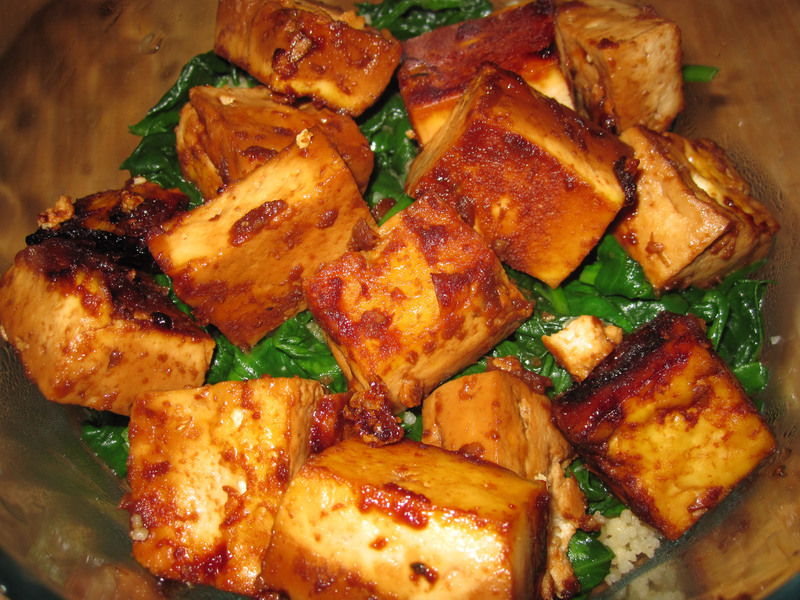 Slice tofu and lay in an 8×8 pan. Mix all ingredients in a small bowl. Pour over tofu. Bake for 30 mins. I love that you have a vegetarian catagory! yummers. I am not a cook…but I just cooked this tonight along with stir fry and it was amazing! i just made this again! its even better if you spray the pan with some pan or oil just so it doesnt stick. Thanks for the tip Abs! So glad you are trying out the recipes!